Recumbent What IS that thing?! Recumbents may be odd looking, but they have many advantages over a "wedgie" bicycle. Discuss the in's and out's recumbent lifestyle in the recumbent forum. I have a coworker that rides a recumbent trike, and has recently started looking around for an electric type horn, similar to the "Hornit". Unfortunately, basically all of the ones found so far look like they would have cables connecting the horn and button that are far too short to actually use from where his hands actually are. There doesn't seem to be any wireless ones, either, outside of *maybe* faking it with this bike theft alarm we found (simply hitting the "make sound" button and ignoring the theft detection part). Does anyone here use some kind of electric horn or siren on their recumbent, and if so how did you get it to work? Illegal in Indiana to use a "siren" on a bicycle. I've only used bells and bulb horns, thus far. Is your coworker limiting his search to electric? I use an Airzound on my recumbent. The horn mounts next to my left thumb and is very easy to access (it's just like all my motorcycles). The tube from the horn to air reservoir is about 3 feet and was pretty easy to mount. The small bag on the front, just behind the BB, holds the air reservoir (I don't remember if the bag came with the horn, but I think it did). Looks like the Hornit uses a coaxial wire that has a molded plug on one end and a molded button on the other. It would not be all that difficult to splice in a length of coax to fit your coworker's configuration; however some coax wire is l gauge so it takes a bit of care. I've lengthened cyclometer wiring, which is very small gauge, with not much problem. For coax wire, I like the 3mm stuff that SON sells for their dyno lighting. Airzound is incredibly loud. Even inattentive MUP denizens will reflexively jump into the brush when one goes off nearby. I would not derive much pleasure from frightening blissed out dog walkers with earbuds in on the MUP. 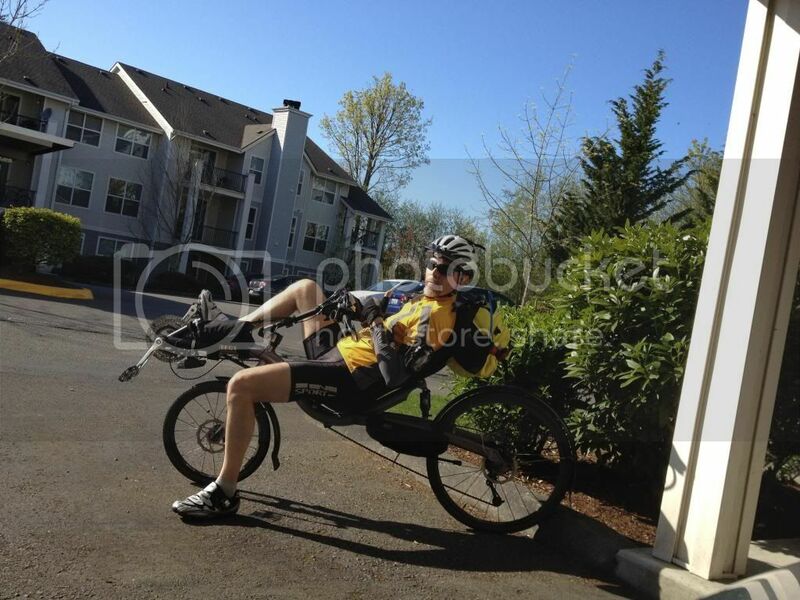 I don't personally believe recumbent bicycles belong on MUP's! The 'stall speed' of the more interesting recumbent bikes is higher than the walking speed of most peds. IMO if you can't trail along behind a ped until you get a passing opportunity that does not force the ped off the path then you do not belong there. Bikes yield to peds, not the other way around. I haven't found that given a reasonable amount of time that most peds won't realize you are behind them. If they do not move over, they don't want to. So I make my own passing opportunity that does not require their active cooperation. So no horn is necessary then IMO. Certainly not some blood curdling high performance specimen like a Hornit or Airzound. Overkill. Period. Brings out the worst instincts for aggression in the susceptible. I've trained my wife out of the habit of 'pinging' peds when we occasionally get boxed in somewhere. The bell is on her bars on the tandems. Its used just for saying hi to kids and other kinds of friendly signalling. The only proper reaction to danger is an immediate defensive reduction in speed or other kind of evasive maneuver. If a horn saved the day it was coincidental. Sadly it can reinforce the feeling that it helped. So people think an even louder horn will work better next time. Manufacturers are happy to oblige. So people are now paying more for their horn than the department store bike its attached to. Doesn't make sense to me. I've owned three cars in my life and I have no idea what the horns of two of them sounded like. The third I only ever used to occasionally toot a neighbor I knew. I've crossed the country east/west and back three times. North//south numerous times. Hundreds of thousands of city and highway miles and never found a horn useful. It really is an ingrained cultural behavior all this horn use. We have been indoctrinated to think it is necessary. Horns are required by the DOT, and bells are required on bikes in many jurisdictions. Few people have any problem with this. They would be far more appalled at my take on it. But here I am, living proof that it really isn't necessary to use your horn several times a week, or even several times a day! It's just a very bad habit. A habit that can be broken. FWIW. Leisesturm, I tend to stay off MUPs for much the same reason. MUP rules favor pedestrians; and people like me, who are trying to make time, belong elsewhere. But in this case the OP didn't mention MUPs. In fact, after the drive-by posting, the OP has been notably absent. I'm not even sure why the post was made here in the recumbent forum. Bikes: Catrike 559 I own some others but they don't get ridden very much. I have a coaches whistle on a lanyard and a "ting, ting" incredibell copy. I've never found need to use the whistle yet. My greatest fear is all of my kids standing around my coffin and talking about "how sensible" dad was.